Reviewing some TES resources I was reminded that Loop cards can make a great starter or plenary. This rather attractively presented resource on Significant Figures by Natasha Keyes is a Word file so could easily be adapted for short question types. Before you create your own though, try this TES collection! 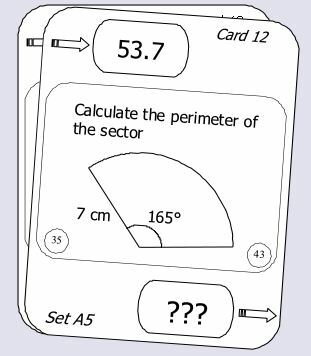 See this great set of Trigonometry Loop Cards from Interactive Maths for example or a Quadratics Treasure Hunt by Nicole Cozens or perhaps some Inequalities from James Lockhart. Note you can narrow the search by Key Stage and then by topic. (There are Loop Card activities available for many subjects, not just Mathematics). The wonderful Tarsia software has Follow Me cards as one of the output types so this could be a good way to create any new sets, the maximum size for a single set is 24. The more sophisticated versions of loop activities like treasure hunts, can make an excellent main lesson activity. MATHSLOOPS from the creator of MathsBox shows how sophisticated loop cards can be; there are three free sample sets (select the Free Samples tab) available, questions aimed at (current!) GCSE grades A, C and G.
Of course Treasure Hunts are very similar in that the answer to a question leads to the next question. I have found Treasure Hunts make a real change in that we are all moving round the room; I find this a good opportunity to also wander round the room and talk to lots of students. With Year 9 this week a Trigonometry treasure hunt worked really well and I learned from them that a witty colleague of mine had hidden one of the questions on the inside of the cupboard door when doing a treasure hunt with them! Returning to MathsBox again there are several free samples available. (To see the collection of free samples, see this page then choose Samples and choose a resource type from the menu on the left.) There are many Treasure Hunts on TES resources – they seem to turn up in the Loop Card search, but you can also search for Treasure Hunts. The simple short answer type loop cards (also sometimes called ‘I have you, who has..’) make ideal starters or plenaries as a whole class activity, each student could have a card each, alternatively perhaps a group of students could have a set of cards for the group.